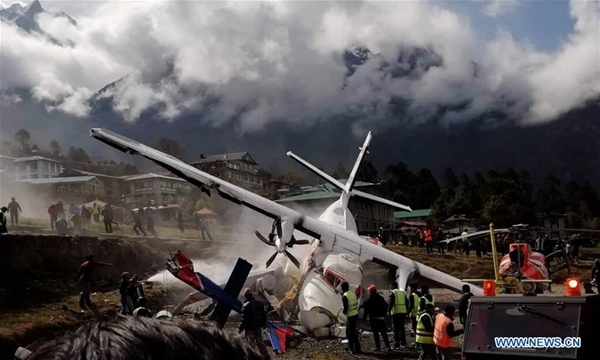 The death toll in Sunday's aircraft collision in Nepal's Lukla airport climbed to three, according to Nepal Police Headquarters. The accident took place while the Summit Air plane was preparing to take off in a mountainous area near the world's highest peak Mount Qomolangma, according to officials. Another two injured people were also airlifted to Kathmandu and are undergoing treatment at the Grande Hospital. "They are out of danger," an official at the hospital told Xinhua. Authorities suspended flights to the airport following Sunday's aircraft collision. In February this year, a chopper carrying seven people including the country's Tourism Minister Rabindra Adhikari crashed in bad weather in Taplejung district of eastern Nepal, killing all seven on board.